Complimentary two-night hotel stay in Europe or free gratuities, wi-fi and beverage VIP package on board. New Showcase Voyages include cruises to Italy, France, Spain, Portugal, Croatia and two brand new ‘Treasures of the Greek Isles’ vacation cruises aboard Star Pride luxury yacht. New Showcase Voyages include two brand new ‘Treasures of the Greek Isles’ cruises aboard Star Pride, pictured above. Small ship luxury cruise line. Windstar Cruises, announces a new “Pick Your Perk in Europe” vacation promotion, with travelers choice between all-inclusive onboard savings of up to $1,700 per stateroom or two free hotel nights in the most popular European cities. The limited time offer is available this spring on 85 select cruise departure dates from April through November 2016, sailing on 15 unique itineraries to the best, most exclusive ports in the Mediterranean. The Yacht VIP perk includes Windstar’s beverage package as well as complimentary unlimited wi-fi and daily gratuities for both guests. The promotion applies to both the all-suite power yachts Star Breeze, Star Legend and Star Pride and to staterooms, suites and the Bridge Suites booked on the one-of-a-kind mega-sailing yachts Wind Star and Wind Surf. Each of the Yachts of Windstar cater to an exclusive guest list under 300 served by up to 190 international crew that are experts in the hospitality field and tailor the yachting experience to each guests needs and desires. Every cruise features a spectacular Private Event ashore in a specially-selected port of call that immerses guests in the local culture and flavors of the region. The “Pick Your Perk” offer is designed for guest convenience and value presenting cruises on 15 unique itineraries to the most sought-after destinations in Europe including the French, Italian and Spanish Rivieras, the chic Amalfi and Dalmatian coasts, and iconic Greek and Turkish Isles. The limited time offer leads up to the summer cruising season in Europe and provides travelers the opportunity to reserve accommodations at newly announced low cruise fares on sailings ranging from $1,799 to $3,599 per person, double-occupancy for 6- to 13-day cruises across the Mediterranean and beyond. With 15 unique itineraries aboard five finely-appointed yachts (both power and sailing yachts) included in the Pick Your Perk portfolio, guests are able to customize the perfect European vacation in Greece, Turkey, Italy, Spain, Morocco, Portugal, and/or France. 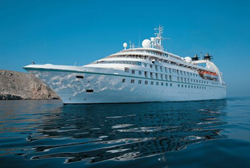 Of the 15 unique itineraries, two are brand new for 2016: Windstar’s Treasures of the Greek Isles cruising aboard the 212-passenger Star Pride yacht explores some of the smaller, hidden ports of Nafplio, Monemvasia and Patmos along the Aegean Sea, while also visiting the legendary islands of Mykonos and Santorini; Treasures of Southern Spain and Morocco aboard Wind Star or Wind Surf visits grand UNESCO monuments and Andalusia’s charming “white villages,” among other highlights showcasing the best of Southern Spain and Morocco. Aboard Star Pride, two newly announced cruises sail roundtrip from Athens, Greece roundtrip on June 9 and September 4. The seven-day cruise stops in six Greek ports along the way including Santorini, Kusadasi, Patmos, Nafplio, Monemvasia and Mykonos. In addition to the off-the-beaten-path ports of call, this itinerary boasts full days in the Greek Isles with late evening visits in Santorini, Kusadasi with a sumptuous Private Event in the evening at the Ephesus ruins, Patmos, and Mykonos. Under the Pick Your Perk promotion, the two free hotel nights, pre- or post- cruise, include a stay at St. George Lycabettus in Athens or equivalent hotel. Cruise fares start at $2,599 per person, double occupancy. Aboard the Star Breeze, Star Legend, Star Pride or Wind Surf, these 14 cruises take place June 25; July 3 and 11; August 2, 18 and 27; September 3, 4, 11, 22, 23 and 29; and October 1 and 5. The eight-day Rome to Venice journey (or reverse) features exciting ports of call including Rovinj, Split, and Dubrovnik, Kotor, Giardini Naxos, and Capri. Exclusive complimentary Windstar Private Events on these cruise takes place in either Dubrovnik with delicious Croatian wines and folklore entertainment at Park Orsula in Dubrovnik with stunning views of the surrounding islands; or in Giardini Naxos with lunch and a tour of a family-run Sicilian winery. The two free hotel nights, pre- or post- cruise, include stays at the Ambasciatori Palace or Savoy Hotel in Athens. Cruise fares start at $2,499 per person, double occupancy. Aboard Wind Star, these 20 sailings occur on May 7, 14 and 21; June 11 and 18; July 2, 9, 16, 23 and 30; August 6, 13, 20 and 27; September 3, 10 and 24; and October 1, 8 and 15. The seven-day Athens to Istanbul (or reverse) itinerary includes the iconic Greek Isles of Mykonos, Santorini, and Rhodes, as well as the Turkish coast with stops in Bodrum and Kusadasi, where guests can visit the House of Mary. Interesting shore excursions abound on this journey, including SCUBA diving in Bodrum for beginning or advanced divers, as well as culturally rich experiences such as visiting ancient Ephesus, an UNESCO World Heritage Site and one of the greatest outdoor museums in Turkey. The two free hotel nights under the promotion, pre- or post- cruise, include stays at St. George Lycabettus in Athens or Pera Palace Hotel in Istanbul, or equivalent. Cruise fares start at $2,299 per person, double occupancy. Aboard Star Breeze, Star Legend, Star Pride or Wind Surf, these 12 sailings take place May 2, 16 and 26; June 11; July 2 and 19; August 1, 20 and 27; and October 14, 19 and 26. The seven day sailing from Barcelona to Rome (or reverse) dances along the French and Italian Rivieras with “bucket list” stops including Portofino, Portoferraio, Cannes, Monte Carlo, Sanary-sur-Mer, and Port Vendres. A popular shore excursion in Portofino includes a trip to the renowned Splendido Hotel overlooking the picturesque harbor of the tiny resort. A favorite of the rich and famous, the hotel is known for its superb Italian cuisine, which guests enjoy along with wine, olive oil, bruschetta, sorbet, coffee, and traditional pastas. The two free nights under the promotion, pre- or post- cruise, include stays at Wilson Hotel & Hotel Indigo in Barcelona and Ambasciatori Palace & Hotel Savoy in Rome, or equivalent. Cruise fares start at $2,099 per person, double occupancy. Aboard Star Breeze, Star Legend or Star Pride these seven sailings take place June 2; July 9 and 17; August 19; October 20; and November 2 and 13. The eight-day voyage from Lisbon to Barcelona (or reverse) includes stops in Palma de Mallorca, Almeria, Malaga, Gibraltar, Seville, and Portimao. Windstar’s complimentary Private Event on these cruises takes place in lovely Palma de Mallorca tucked in the heart of the old quarter, guests are treated to an evening tour of a modern palace enjoying artwork by Rodin, Dali, and other famous painters. Tapas are then enjoyed on the terrace along with local vermouth, wine, and beer, followed by a performance by Mallorcan folk dancers. The two free nights under the promotion, pre- or post- cruise, include stays at the InterContinental in Lisbon and the Wilson Hotel & Hotel Indigo in Barcelona, or equivalent. Cruise fares start at $2,299 per person, double occupancy. Aboard Star Breeze, Star Legend or Star Pride, these six cruises occur on June 16; August 26; September 20, 26 and 30; and October 9. The nine-day journey from Venice to Athens (or reverse) explores the Adriatic on a voyage along the ancient trade routes through the narrow Corinth Canal, to the ancient oracle of Delphi and into the stunning fjords of Montenegro. With port visits in Nafplio, Itea (Delphi), Katakolon, Butrint National Park, Kotor, Dubrovnik, and Hvar, the itinerary also boasts incredible shore excursions from gondola rides in Venice to off-roading on Hvar Island and kayaking the city walls of Dubrovnik. The two free nights under the promotion, pre- or post-cruise, include stays at St. George Lycabettus in Athens, or equivalent hotel. Cruise fares start at $2,499 per person, double occupancy. Visit http://bit.ly/pick-your-perk-pr for a full listing of available itineraries under the Pick Your Perk limited-time promotion. For more information, including rates and itineraries, contact a travel professional or call Windstar Cruises at 1-800-258-7245, or visit http://www.windstarcruises.com.